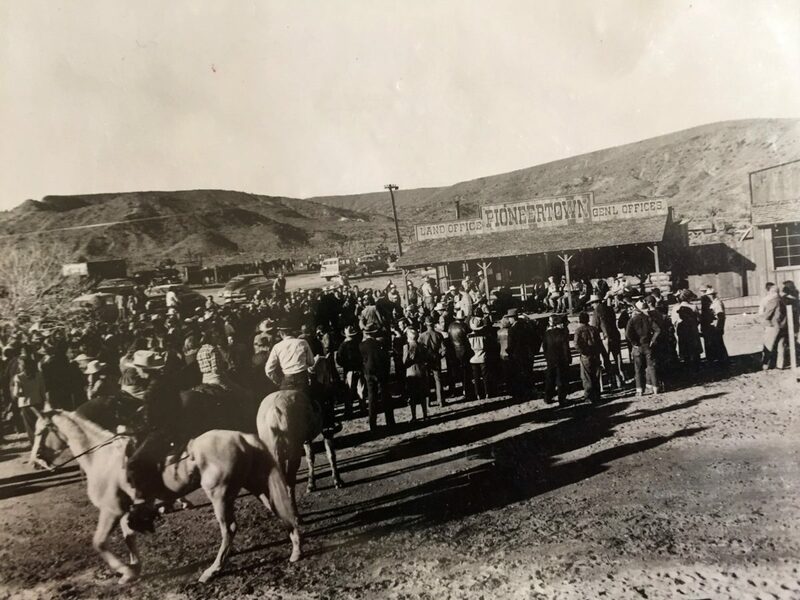 PIONEERTOWN–A Typical Sunday crowd. The theme here as can be seen is strictly horsemanship. VICTORVILLE, Cal. – In them thar hills of the Mojave desert thar’s gold alright, but a different sort than the old-time prospectors were looking for. The era of the burro, the Grubstake and the diamond hitch is gone, superseded now by a wave of smooth talking man is shiny cars pitching camp in flamboyant real estate offices with billboards to the right and billboards to the left. The land of the cactus and the yucca is for sale – in a big way. A swarm of newcomers to these parts, mostly promoters from Hollywood are beating the sage brush here–making out lots, surveying roads and drawing up glamorous plans for proposed club-houses, airports ,swimming pools, apartment hotels and like. IT IS THE vacation minded people these entrepreneurs are after. Four at a color the salesman affect western gear — wide brimmed hats and flashy colored shirts, even hi -heeled boots. In place of the 44, they tote blueprints of things to come. But there is a real activity in the subdivisions near here. You can follow the arrow the places in the brush newly marked with white stakes. 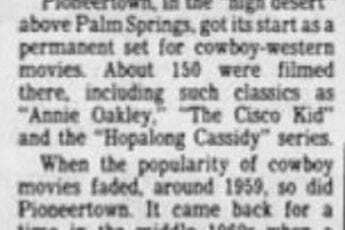 When you get corral at the tract office the palefaced westerner will show you right-off where some moving picture star, say Roy Rogers, has bought a lot. And he will explain that the proposed town will be carried out exclusively with an Old West motif. THE MAN talking to you, of course maybe just in from Chicago… But no matter he has a great big banana around his neck and he is chewing gum like it was t’bbaccy. He says there will be nothing but hoss-drawn carriages on the main street. Nothing so crude allowed as there here modern motorized contraptions. Liable to run down, after you have just left the proposed Likker barn. He may tell you all this while sitting in his sleep making 1948 model fresh from Detroit. The new subdivision as if you like cabins grouped about Nell’s Ice Cream Palace and such. They can show you on a map where the swimming pool will be. In most of these promotions the lots are, for a fact, selling like hotcakes. The first structure that goes up, usually, is the cocktail bar. After that, like as not the general store and land office. One realtor states that 40 per cent of his sales are made to easterners looking for sunshine and a healthy place to retire to. Buyers are pay out cash in the amounts of $500 to $15,000 an acre. Prices are up well over 1000 per cent from prewar days when the tax collector owns a good portion of land. THIS WINTER they are oiling the roads to beat the band. Crews are working steadily on all kinds of new buildings, motor courts, apartment hotels and houses. Over 100 new homes have been finished in one development seven miles east of here known as apple valley ranch. Apple Valley’s altitude is 3000 feet above sea level and it is only 80 miles from Los Angeles. The price $2,350 an acre. However, there are complications. The utilities are in, and finding water out here is a feat in itself. Some wells cost as much as $7000. In other places, piping and flumes from the mountains run into larger sums. It is reported that almost $3,000,000 has been poured into this Apple Valley Rancho development by its backers, Newton T. Bass and Bernard J. Westlund, Los Angeles oil men. Two thousand lots have already been sold. Other nearby tracts include Desert Knolls and Desert Mesa Estates. Incidentally, these places are situated conveniently for winter sports recreation in addition to the much touted healthful desert sunshine. It is only a few hours drive up to the Big Bear and Arrowhead lake regions. The Mojave Desert development is following on the heels of the tremendous popularity of the Palm Springs resort area located on the Colorado desert at sea level and below in this region land once useless has bloomed under expensive subdivision improvements and prices as high as $15,000 an acre. 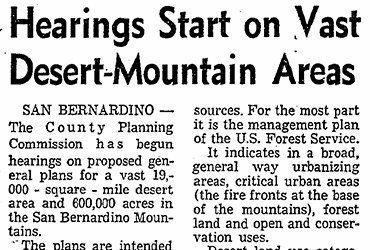 REMINISCENT OF Swiss tourist attractions, a new tramway lift from the desert floor to the top of San Jacinto peak is planned. Costing an estimated $4,000,000, it will carry passengers in cable suspended cars from Palm Springs up 8500 feet to the winter sports area in a matter of 20 minutes. While the dude ranch country around Victorville is suitable for all year vacationing because of the altitude, near Palm Springs the season is limited. In summer temperatures, as at Needles and Blythe and Yuma, run over 100 degrees and the resorts close down. Both lots of moving as quickly here as on the Mojave desert. Near the La Quinta and Desert Club area, at the base of the mountains, land is selling ads $1500 an acre, and 3500 acres are being ready for sale. At Palm Desert and acre parcels bring almost anywhere from $1250 to $6500 an acre. Meanwhile, more businessmen are entering the picture, bidding millions on new developments. For instance, new acreage now being added includes such vacation locations as one her palms, Palm Bay Village, thunderbird ranch and your Centro Estates. THE FIRST great trek of vacationers into the desert began 10 years ago, interrupted during the war period. And early in development is the town of Twenty-Nine Palms. 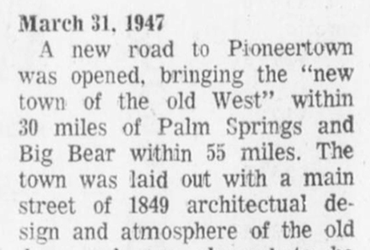 Now a new subdivision Pioneertown, is going up about half way between Palm Springs in Twentynine Palms at a 4000 foot elevation on the rim of the Mojave. The theme here is strictly horsemanship. The draft is being promoted in the western way, with movie singers “the Sons of the Pioneers,” on hand for the recent dedication day.